Using /clear while an inventory is open and you are holding an item with your mouse causes an inventory desync and turns this item into a "ghost" item. 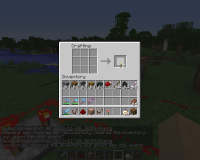 You can place it in your inventory, but using it will fail in Creative mode and in Adventure and Survival mode additionally removes the item. Expected would be that /clear successfully clears the held item client-side as well. The following is based on a decompiled version of Minecraft 1.8 using MCP. All method and class names are the ones used in the decompiled version. MC-98797 /clear command returns successful but the item isn't removed at all. MC-98799 While running a 1 give command per second, you can dupe items. 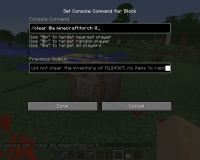 MC-132562 command /clear or "Item-ghost"
MC-135205 A function with a clear command used by advancements creates ghost items. MC-137064 "Ghost Items" remain in inventory when cleared.